JEDDAH: Describing Saudi Arabia as the center of Islam, religious scholars and intellectuals said media attacks against the Kingdom offend more than 1.8 billion Muslims across the world. The scholars expressed their solidarity with Saudi Arabia on Sunday — the final day of a conference titled “International Conference on Islamic unity — the perils of labeling and exclusion” organized by the Muslim World League (MWL) in Makkah. They said the Kingdom and its leadership command great respect due to their services to Islam and Muslims. 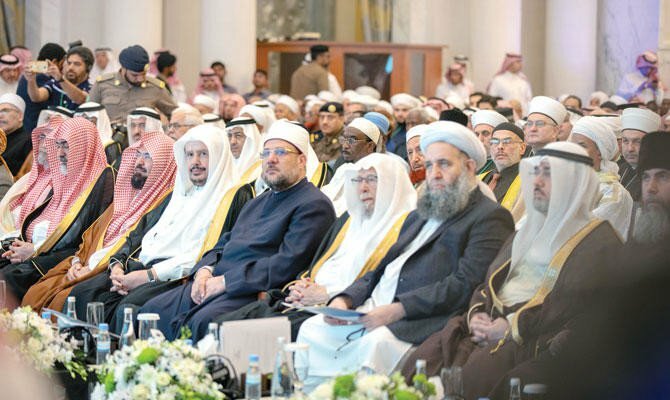 The conference, organized under the patronage of King Salman, was attended by more than 1,000 religious scholars and intellectuals from 128 countries. The participants of the conference called for a comprehensive plan to address sectarianism and extremism. They also stressed the need for creating effective channels of communication between followers of different Islamic schools of thought to remove misunderstandings and increase cooperation. They unanimously rejected sectarian views and extremist ideas and urged scholars and preachers to play their role in uniting Muslims. The scholars recommended the establishment of an all-inclusive committee to draft a comprehensive Islamic charter that lay down rules to resolve disputes between Muslim and to help forge unity among different schools of thought.